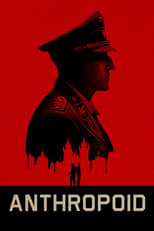 Based on a true event; the movie concentrates on Operation Anthropoid devised for the assassination of lesser known Nazi leader Reinhardt Heydrich who was third in command after Hitler and Himmler. Anthropoid is directed by Sean Ellis and was released on Sep 9th, 2016. Director Sean Ellis's History & Thriller movie Anthropoid is produced by LD Entertainment & 22h22 & was released 2016-08-12.